– this time with festival pic! I missed a trick at Jisc DigiFest yesterday. All the other presenters at David Kernohan’s splendid “Whatever happened to the MOOC?” session kicked off with a festival anecdote. David and Viv Rolfe, even had pictures of themselves playing at festivals! How cool is that?! I, however, launched straight into open education policy and practice :} Afterwards, James Clay rightly complained about my lack of festival-going anecdote. 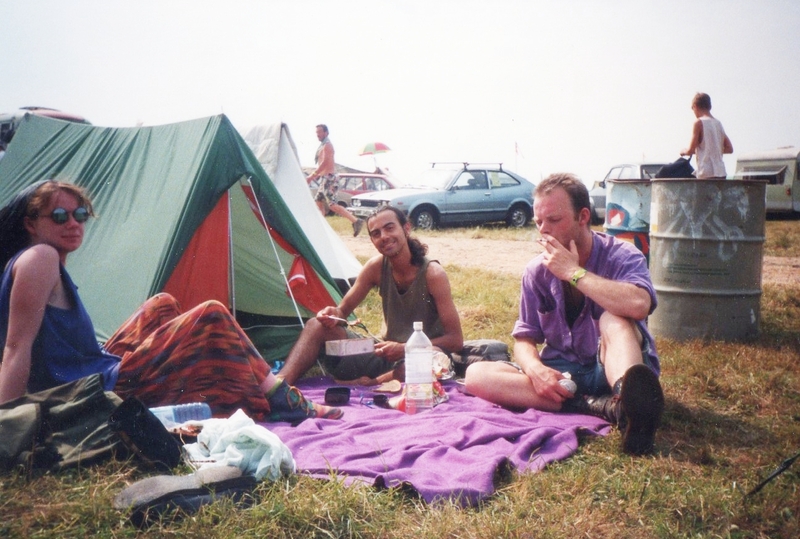 So here, as promised and by way of recompense, is a picture of me at Glastonbury in 1992. And once you’ve all stopped laughing, there’s a copy of my presentation below. “We’ve heard about some really inspiring open education developments, many of which have their roots in the UKOER programmes. We know that it’s notoriously difficult to measure the impact of short term innovation funding, but two years after the end of UKOER, it’s interesting to look back and see that the programme does seem to have had a hugely positive impact right across English higher education. One of the aims of UKOER was to embed open education practice across the sector and it’s actually starting to look as if has done just that. The situation is rather different north of the border. Scottish institutions were not eligible to participate in the UKOER and, arguably, this has resulted in lower awareness of the potential benefits of open education, and open education practice is less well embedded across the sector. Although there have been no comparable large scale funding initiatives, we have seen a number of innovative open education developments within Scottish education, particularly in the area of open badges and MOOCs, and groups like the Open Knowledge Foundation and Wikimedia UK have also made real efforts to engage with the education community. In an attempt to join up these initiatives and disseminate open education practice more widely, Cetis, SQA, Jisc RSC Scotland and ALT Scotland, launched Open Scotland, a voluntary cross sector initiative that aims to raise awareness of open education, encourage the sharing of OER, and promote the development of open policy and practice. Open Scotland partially takes its inspiration from Nordic OER “a network of stakeholders to support uptake, adoption and collaboration around OER in the Nordic countries” and we’ve also been inspired by Higher Education institutions in Wales who came together to agree a statement of intent to adopt open educational principles. We see this statement as a positive development and are interested to see what impact it will have in practice. Open Scotland has undertaken a number of awareness raising activities including the Open Scotland Summit, which brought together senior managers, policy makers and key thinkers to explore the development of open education policy and practice in Scotland. The Open Scotland blog was launched to disseminate news relating to all aspects of openness in education and to act as a focal point for discussion and debate. We have also just this week released the first draft of a Scottish Open Education Declaration. This is based on the UNESCO Paris OER Declaration, but extends its scope to focus on open education in general, rather than OER in particular. We invite all those with an interest in open education to contribute to shaping this draft declaration so we can reach a consensus on open education principles that will benefit all sectors of Scottish education. There have also been some significant developments at Government level. In a speech earlier this year, the Cabinet Secretary for Education outlined the Scottish Government’s vision of higher education and acknowledged the potential of MOOCs to form new pathways to learning, to widen participation and promote a culture of collaborative development and reuse. While it is hugely encouraging that the Scottish Government has started to acknowledge the potential of open education, there is some concern that the scope of this vision is insufficiently broad and may fail to encompass the wider benefits of open education to the Scottish sector as a whole. We all know that MOOCs are just one component of the wider open education landscape. This entry was posted in higher education, MOOCs, oer, openscot, policy and tagged cetis, digifest14, moocs, oer, open, openscot. Bookmark the permalink.